Fed up with Gov. Scott Walker’s attacks on working people and their unions, local fast-food and hospital workers in the Fight for $15 will took to the Wisconsin statehouse Wednesday, Jan. 25, to protest the governor’s State of the State address, stressing their commitment to defeating Walker and electing a pro-worker governor in the November election. Gov. Walker and Republican state lawmakers have waged a string of attacks on workers’ unions in recent years. 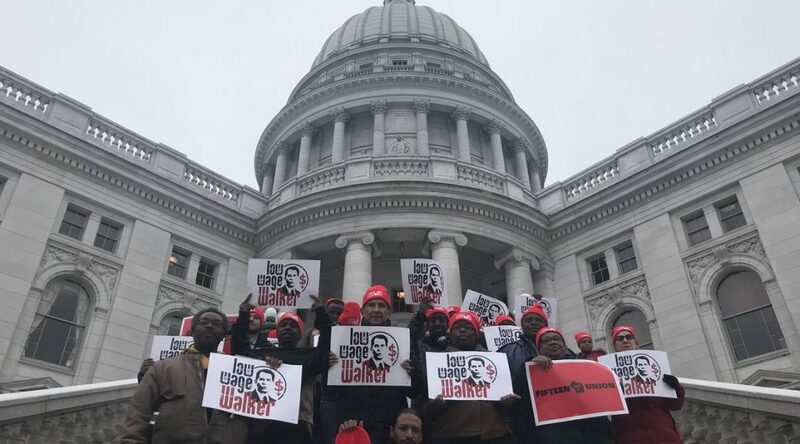 Over the past eight years, Walker has blocked minimum wage increases, killed Wisconsin’s century-old wage boards, and busted the very unions that fight for working people, all while giving corporations major tax handouts. Ahead of the 2018 election, the Fight for $15 movement in Wisconsin will volunteer 40 hours of their time in an unprecedented effort to engage voters in the state who have been left out of the political process. Get involved in the fight in 2018 by signing up to volunteer 40 hours before the election. Join the 40 for 15 Today!